Company produced kitchen appliances continue to make glad of consumers. We already wrote about smart kitchen from LG and Kenmore, smart fridge from Samsung or Electrolux. Now it’s time for iChef oven by Gorenje. The oven sports large finger-friendly touchscreen to display a cooking program menu from SIMPLEbake, AUTObake, MYbake, EXTRA and PRObake to STEPbake. Like in digital camera you can choose fully automated mode, adjust it a bit or set your own cooking parameters. Unfortunately there is no possibility to control the iChef or receive notifications about cooking progress using smartphone like it’s done in LG Thinq. But maybe Gorenje will add that feature before the iChef will be available in Europe this spring. 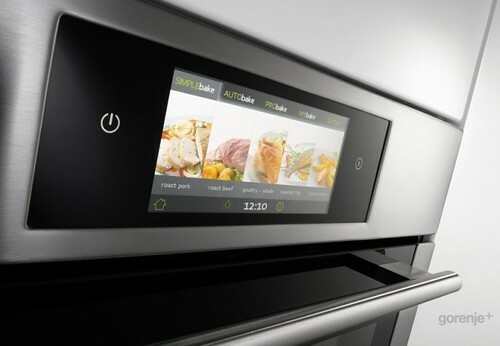 This is a gorgeous looking oven – love the touchscreen feature! Yeah, it looks very impressive. Also it should help with cooking processing.